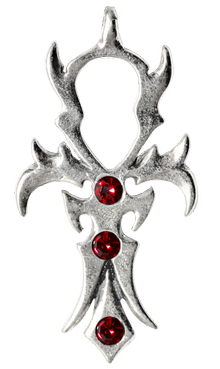 Devilishly blending Beauty with Temptation, this Impish Cross is desinged to inspire the wearer to sacrifice their Inhibitions on the Altar of Hedonism. 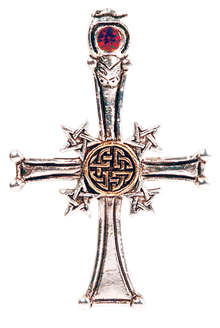 A powerful synthesis of Christian and Pagan symbols interwoven around the Celtic everlasting Knot of Life, forming a powerful Magickal Amulet for Protection. As the only nocturnal flying mammal, bats have, from the beginning of time, been associated with flight and the night. Lamia, Latin for Witch or Vampire, is both a symbol for darkness and also for the Blood of Life and Renewal. 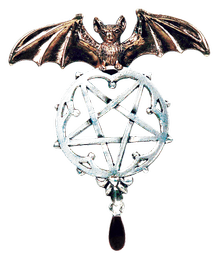 Clutching its Divination Ball, the Dragon symbolises Life Force combined with the Magickal energy of the Pentagram to form a powerful Talisman for scrying into the future. 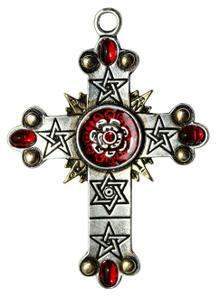 Based on the Sigil of Zagan from the Goetia of Solomon, this cross is reputed to make the wearer witty and to bestow upon him or her the power to turn water into wine, metal into coins and even make fools wise. For Transformation. 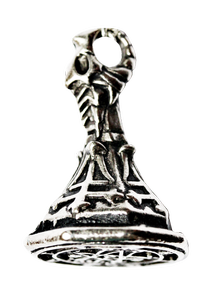 Symbolising the Key to the gate of King Solomon’s Occult learning and Arcane Knowledge this Magickal pendant is reputed to bestow upon its wearer the power of Sorcery and should be used with the Wisdom of Solomon. A Sun Goddess for growth, harvest and fertility, Saule was known as the Sun-Virgin and Mother Sun. Her sickle is reputed to bestow upon the wearer Abundance and Plenty. 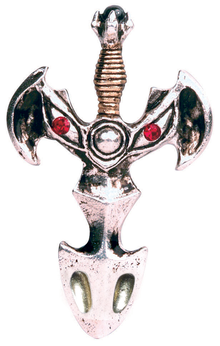 Symbolising the synthesis of the Elements of Fire (represented by the Dragon) and Air (represented by the Sword), this potent Magickal weapon can be used as a Talisman for Vitality, Wit and Protection. 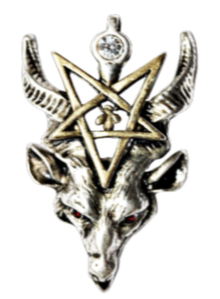 FB3 Seal of Astaroth - Power & Knowledge. A working wax seal. Reproduced from the Goetia, the famous Magickal Grimoire of Solomon, this functioning wax seal is reputed to be able to cause Love between and man and a woman, raise thunder and lightning and give answers to all things Secret and Divine. 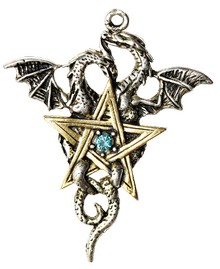 Intertwined in perfect Harmony, the male and female Dragons represent the polarity of the Life Force around the five Elements of the Magickal Pentagram, forming a Talisman for Balance and Stability. 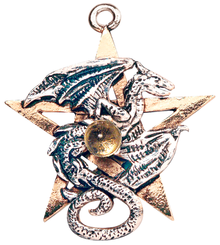 The Life Force, symbolised by the Dragon, in harmony with the Powers of the Intellect invoked by the Athame (representing Air) combine to create a powerful Talisman for bringing ideas into reality. FB15 Eagershelm - Protection & Achievement. 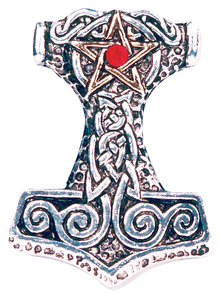 Also known by the Vikings as Aegisjalmur this eightfold spindle symbolises order and completion. 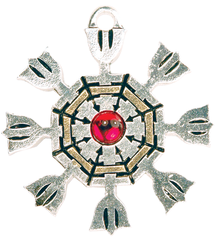 Considered to be the greatest Talisman for Magickal Power in the North, it is reputed to help its wearer create Order from Chaos, successfully complete all tasks undertaken and is considered to have Protective Powers. 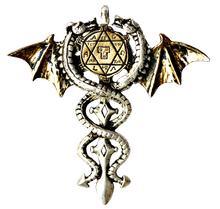 Centred around the Star of Solomon, inscribed with the Tetragrammaton (the Holy Hebrew Name of God) the Dragon Guardians serve as a reminder of the potency of this powerful, protective Amulet. 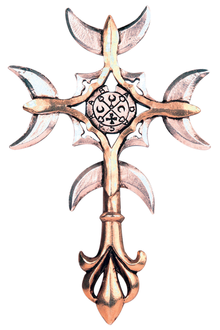 Designed by S.L.MacGregor Mathers, the Head of The Order of the Golden Dawn and combining the elements, the planets and the 22 paths on the tree of Life, this extraordinary Cross can be the key to Initiation on the path to High Magick. Can be empowered to any High Purpose. 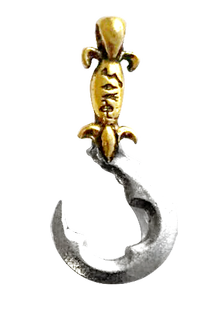 In legend, a vessel of Prophecy and Magick, thought by many to be the key to finding the Dragon’s Treasure. 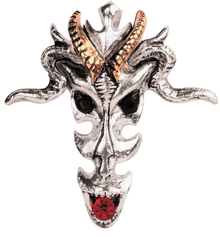 The Dragon Skull’s grim exterior conceals a Talisman for Wealth and Riches. 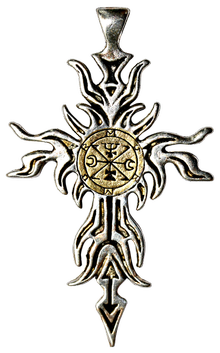 Centred around an Arcane symbol from the Grimoire of Goetia this Magickal Cross is reputed to bestow upon its wearer the Power of Second Sight. 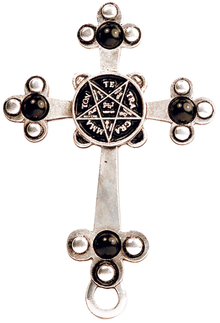 Constructed around the most profound symbol in the Lesser Key of Solomon, the creative light of the Holy Tetragrammaton inscribed in the central Pentagram, balances the dark energy of the surrounding cross in a perfect metaphor for Universal Polarity. Reputed to bestow upon its wearer the power to see Darkness where others see light and Light where others see Darkness.